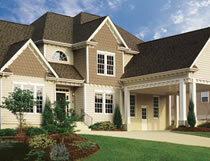 When choosing the type of siding you are going to install on your home, you have many options. 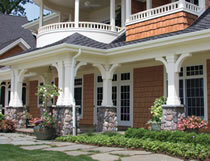 We have an exceptional selection of affordable styles of siding with outstanding performance. New siding can make your home more energy efficient, prevent wind infiltration and beautify your home with your own personal style. Below is some information on the types and styles Cox Roofing offers. Introduced to the market in the early 1960s, vinyl has grown in popularity because of its durability, versatility and ease of maintenance. Manufactured with polyvinyl chloride, it is impact resistant, rigid and strong. Vinyl is available in a broad palate of colors, as well as a limited range of patterns. It is also is available in many profiles, including horizontal and vertical panels, shakes, scallops, shingles, fish scale, traditional lap, Dutch lap and beaded designs in various widths. With the ability to withstand high winds (certified up to 110 mph or higher) and a composition that resists heat, cold and moisture, vinyl siding retains its looks over time. Vinyl siding never needs to be painted. The only maintenance it requires is a simple wash with a soft cloth and garden hose. For those who want the appearance of wood siding without the hassles and costs associated with it, fiber cement siding is the best choice. Available in a variety of textures, fiber cement is more durable than wood. It’s also termite-resistant, water-resistant, non-combustible and warranted to last fifty years. Fiber cement siding is composed of cement, sand and cellulose fiber that has been cured with pressurized steam to increase its strength and dimensional stability. The fiber reinforces the product and prevents cracking. 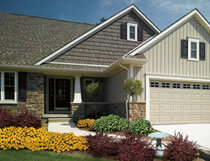 This siding product will protect your home from rot, fire, wind and insects. An advantage of fiber cement siding is its attractiveness and variety of styles that have embossed wood grained texture, stucco or smooth finish. These products are combined with various types of vinyl trim to block the weather. Vinyl ventilation accessories may also be utilized and painted as you wish. Another benefit of fiber cement siding is the virtually unlimited choice of colors provided by water-based acrylic paint, which grips these products very well and doesn’t peel because the products do not expand and contract like wood. Paint typically lasts up to 15 years. Stains may also be applied to fiber cement. Wood is a traditional siding material, either in shakes (shingles) or clapboard form. While it isn’t as common in recent years, wood siding was used on houses for hundreds of years. Wood siding is the most environmentally friendly option, as it is a renewable and biodegradable resource. With the ability to be painted, wood siding provides the owner with the option to change the look of their home as they see fit. Give us a call today at 443-449-5273 or click here to get a FREE Estimate! Cox Roofing, a division of BLC Construction Enterprises, Inc. (MHIC#: 129907 & PHIC#: PA116207), has over 30 years of combined experience serving the commercial roofing needs in the the greater Baltimore, Maryland area. We now offer financing on all jobs to $30,000 through both First Mariner and HFS. Please click below to Apply online.